It was a stellar day in upstate New York today. Some would call it stupendous – me included. This is my favorite time of year to horseback ride. I love everything about it – the smell of dead and dying leaves, with their reds, yellows and oranges smashed like melted crayons on a canvas of Crayola “Pacific Blue.” I love the brisk mornings and warm afternoons. I love the smell of wood stoves, cranked up for the first time since last winter. It’s just all good. Buzz and I set out for our usual Saturday morning ride today, matched in our mellow moods. We headed to the field and met my friend Barb on the way. We love the field – a wide open expanse of wild grass now yellow and long enough to shift like ocean waves. We mostly plodded until we came to ‘the hill,’ the place where we all like to practice our ‘faster gaits.’ Today we didn’t rip. We just set into a comfy jog, Buzzy and me in the lead and Barb and Pepper ambling along behind. When these things happen, I never know what in fact happened, but what I do know is that some enormous, hideous-looking feathered creature dive-bombed Buzzy and me and as it did so, Buzzy became airborne in a sideways leap. He stopped, frozen and I, incredulous, watched the thing that came at us flap its incredible wings and sore high. In my first moment of rational thought, I was grateful Buzzy was leading because although Barb’s horse is a lovely mare, she’s hot, and when she’s faced with a ‘questionable’ situation, she’s outta there! As in bolt, full speed ahead. And lord knows what Buzzy would’ve done had she been in the lead. “Look, they’re everywhere,” Barb yelled. Indeed they were – 30 or 40 of them, in trees, in the air, and several spread out in the field. The horses were dancing up a storm now, anxious to head home. Barb and I were also anxious to head home. “Must be something dead around here,” I ventured, voice quaking. “Yep,” she answered, voice quaking. 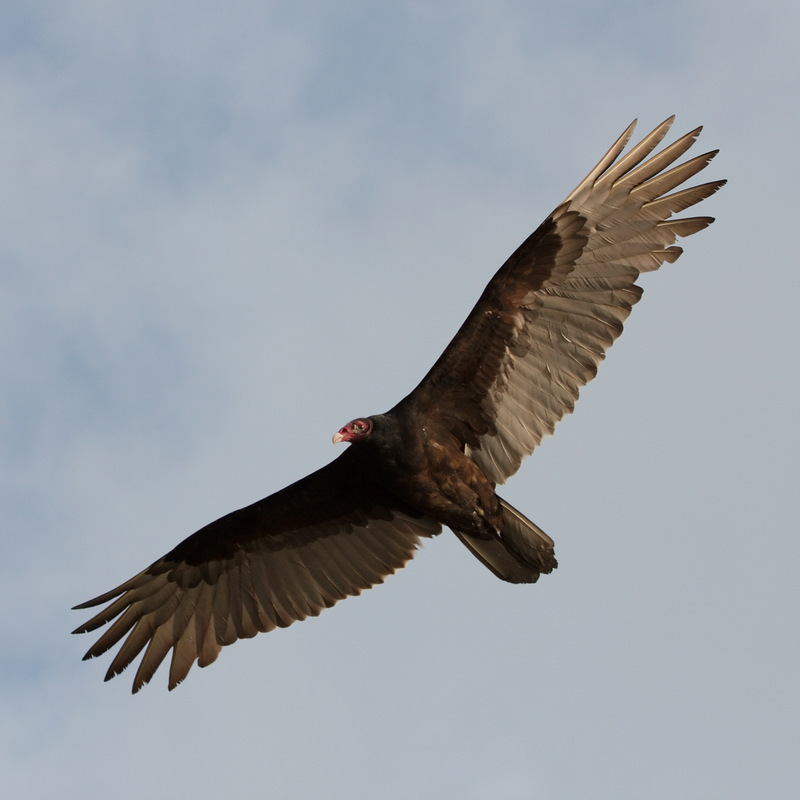 Turns out we’d just been acquainted with a ‘committee’ of turkey vultures: prehistoric-like avian creatures with 6 foot wing spans – longer than most horses. After we turned back and headed home we had no further excitement. I’m just glad Buzzy is Buzzy and that I was in the lead.